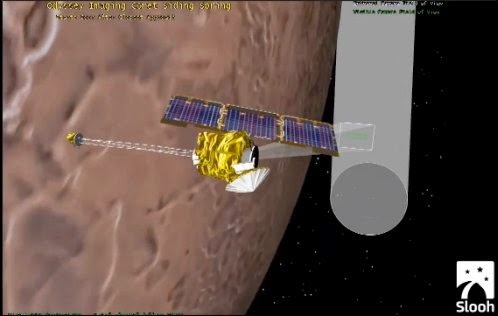 The MAVEN spacecraft reported back to Earth in good health after about three hours of precautions against a possible collision with high-velocity dust particles released by comet C/2013 A1 Siding Spring. MAVEN began orbiting Mars on Sept. 21. The opportunity to study this rare near-miss of a planet by a comet comes during the project's commissioning phase. A few weeks of instrument calibration and orbit fine-tuning remain before the start of the primary science phase. The mission will study the upper atmosphere of Mars and its interaction with the solar wind. Comet Siding Spring hurtled past Mars today at about 125,000 mph (56 kilometers per second), coming within about 87,000 miles (139,500 kilometers) of the planet. That is equivalent to about one-third of the distance between Earth and Earth's moon. The closest approach by the comet's nucleus came at about 11:27 a.m. PDT (2:27 p.m. EDT). The period when dust from the comet was most likely to reach Mars and the orbits of spacecraft around Mars peaked about 100 minutes later. From about 10:45 a.m. to 2 p.m. PDT (1:45 p.m. to 5:00 p.m. EDT) MAVEN kept in a defensive posture to reduce its profile relative to the direction from which the comet's high-velocity dust particles would come. In that "hunkered down" orientation, its main antenna was not facing the right way for transmitting to Earth, so communications were maintained at low data rate via a secondary antenna. Also, the mission performed a maneuver on Oct. 2 that set its orbit timing so that the spacecraft was behind Mars, relative to the possible dust flow, from about 12:53 p.m. to 1:23 p.m. PDT (3:53 p.m. to 4:23 p.m. EDT). Downlink of data has begun from MAVEN observations of the comet and Mars' atmosphere. Some observations are designed to provide information about the composition of the gases and dust being released by the comet. Others are investigating possible interaction between material from the comet and the atmosphere of Mars. 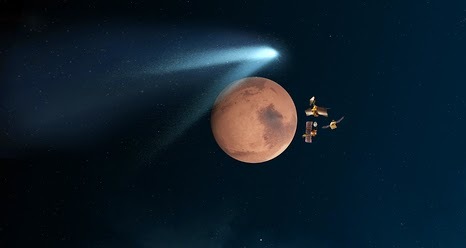 Three NASA Mars orbiters (MAVEN, Mars Reconnaisance Orbiter and Odyssey Orbiter), two Mars rovers (Curiosity and Opportunity) and other assets on Earth and in space are studying comet Siding Spring. This comet is making its first visit this close to the sun from the outer solar system's Oort Cloud, so the concerted campaign of observations may yield fresh clues to our solar system's earliest days more than 4 billion years ago. 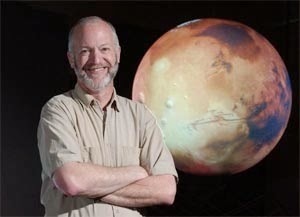 MAVEN's principal investigator is based at the University of Colorado's Laboratory for Atmospheric and Space Physics. The university provided two science instruments and leads science operations, as well as education and public outreach, for the mission.